Southeast of Santa Fe, New Mexico are the remains of what was once the largest Indian pueblo in the Southwest. Pecos Pueblo dominated a major trading route between the farming Pueblo Indians and Great Plains' hunters. The pueblo was also a way station on the Santa Fe Trail. This site is the setting of a continuous story of human habitation covering a 7,000-year period. Today, Pecos National Historical Park preserves evidence of the life of a prehistoric Southwest people, and also tells part of the story of the Spanish exploration of America. Park Hours and Visitor Center. The Park is open daily, except December 25, from 8 a.m. to 5 p.m. For additional information, contact the Superintendent, Pecos National Historical Park, P.O. Drawer 418, Pecos, NM 87552. There is a $3.00 entrance fee per person that good for 7 days. The ruins trail, picnic area, and visitor center are the only areas currently open to visitors at this time. Closed areas such as the Forked Lightning Ranch, the Santa Fe Trail, and the Civil War Battlefield of Glorieta are available only through ranger guided tours. To schedule a tour, please contact the visitor center for more information. Reservations are required for the Weekend tours. Pecos's recorded history began sometime around 800 A.D., when Pueblo settlers in the Rio Grande Valley moved into the upper Pecos Valley to form scattered hamlets. Around 1100 A.D., Pueblo Indians spread eastward over the Sangre de Cristo Mountains and settled in villages. Two centuries later, they began moving into compact pueblos. Over time, the population slowly grew, but around 1200 A.D., it dramatically increased, possibly as a result of immigration. Cicuye Village was a quadrangular pueblo, home to more than 2000 aborigines. These people raised corn, beans and squash; they also made pottery, hunted deer, and occasionally killed one of the many bison that roamed the plains to the east. The pueblo was constructed like a fortress, with high outside walls. From its ramparts, Pecos warriors had a clear view in all directions. A perimeter wall provided a defensive line against attackers. The name "pecos" may come from the Spanish "pecoso," meaning freckled. What might have been freckled about the village or its inhabitants is anybody's guess, but the name did become permanently established and has been applied to the nearby river and to two towns, one at the canyon mouth about two miles from the pueblo, and another in west Texas. The pueblo contained numerous ceremonial chambers, called "kivas," and was built around a central plaza on a rocky ridge. What gave Pecos a military advantage was its strategic location between the agricultural Pueblo communities of the northern Rio Grande to the west, and the nomadic hunting tribes of the plains. Trade became a central factor in the pueblo's economy. The arrival, in 1540, of one of Coronado's lieutenants with accompanying soldiers did not provoke a furor among the people of Cicuye, because some of them had previously seen Coronado and his followers at nearby Zuni Pueblo. A Coronado chronicler described Cicuye as "a strong village, four stories high. The houses do not have doors below, but instead ladders are used which can be lifted up like a drawbridge." Pecos was spared further contact with Spaniards until 1590, when Castano de Sosa stormed and subsequently occupied the pueblo with a well-armed force. In 1598, Juan Onate, first governor of New Mexico, assigned a priest to live in the pueblo; he attempted to convert the inhabitants to Christianity. A small church was eventually built; soon to be superceded by a larger structure named "La Mission de Nuestra Senora de Los Angeles." The mission consisted of the church and living quarters for Franciscan friars, along with classrooms, workshops, cow corrals and grazing land. The friars introduced farming practices, bread making, metal tools, animal husbandry and Christianity. They also suppressed native religious practices. After Santa Fe became the capital of New Spain in 1610, Pecos assumed increasing importance to Spanish authorities. Strategically located on a route from the northern Rio Grande Valley around the southern tip of the Rocky Mountains to the Great Plains, Pecos was seen by the Spaniards as a friendly community that could act as a buffer against Apache and Comanche raiders. At the same time, it could serve as an intermediary in profitable bartering between those Indians and the Spanish. The Pecos Indians, however, were unpredictable with respect to their attitudes toward Europeans. At times they actively resisted intrusion by Spanish military authorities and rejected attempts by friars to convert them to Christianity. But on other occasions, they seemingly accepted the invaders and adopted use of their tools, food and livestock. New Mexico Indians also seemed to accept the Spaniard's God and built structures for His worship. Eventually, however, the New Mexico pueblos decided they had had enough of Spanish rule. Exasperated by continued religious persecution, they went to war. During the summer of 1680, Pecos men united with warriors from other Indian villages and staged a successful, albeit short revolt. In these hostilities, Spanish colonists were murdered, Franciscans martyred, and many Indians were executed after being taken prisoner. During the uprising, symbols of Spanish dominance, including public buildings, homes, farms, and religious structures, were set aflame. The first Catholic Church at Pecos did not escape the flames. The Spaniards returned in force in 1692 and reclaimed all of Pecos Pueblo land. 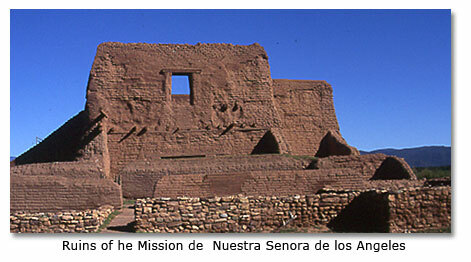 They also supervised rebuilding the destroyed Mission de Nuestra Senora. The decline of Pecos Pueblo began in the 17th century as trade with surrounding tribes lessened. The population was further reduced by European-introduced diseases, and by warfare with Comanches. By 1788, only about 180 inhabitants remained in the pueblo. Time and storms contributed to the gradual deterioration of the high-walled village and church. Finally, in 1838, after almost three centuries of combating neighboring tribes and various forms of pestilence, the last 17 disheartened inhabitants abandoned their once-populous ancestral village and made an 80-mile trek northwest to Jemez, the only other pueblo that spoke their Towa language. The people of Jemez had given an invitation to come, and provided houses as well as fields. Neither the people nor the village of Pecos ever really died. At Jemez, the Pecos refugees steadfastly clung to their own heritage, although they did comfortably settle into new surroundings. From time to time, they made pilgrimages to their ancestral home. Their descendants, who still live in Jemez, retain pride in their ancestral ties to Pecos. In 1880, banker turned archaeologist Adolph Bandelier began investigations of southwestern Indian culture by examining the Pecos ruins. He studied the tumbled walls, photographed them, accumulated artifacts and interviewed local residents about their recollections of the village and its former occupants. Bandelier also saw the church gone to ruin because uncaring persons had ripped out beams, scarred the walls with graffiti, and even exposed dead bodies in the cemetery. In 1904, Dr. E.L. Lewitt of the School of American Research published a research paper that aroused interest in the Pecos ruins among archaeologists and historians. From 1915 to 1927, Pecos was the subject of one of the first organized excavations of a southwestern ruin. 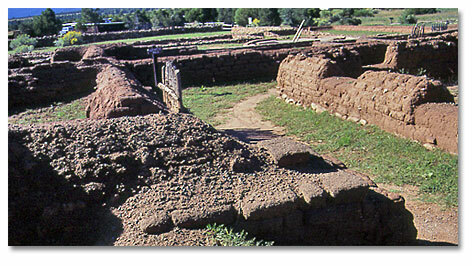 Following the designation of Pecos Pueblo as a national monument in 1965, additional digging and stabilization of the last church by a National Park Service archaeological team uncovered the long buried foundations of an older, much larger church beneath the footings of the presently standing one. Indications were that the earlier church had burned and that the existing building had been constructed almost entirely within its nave. It is now known that the edifice, which had been consumed by fire, was actually the second church at Pecos. The community had, in fact, had a succession of four churches, two of which left few remains. In February 1935, the Pecos site was proclaimed a New Mexico State Monument. Some 30 years later, President Lyndon Johnson signed a bill establishing Pecos National Monument in order to protect significant archaeological ruins. 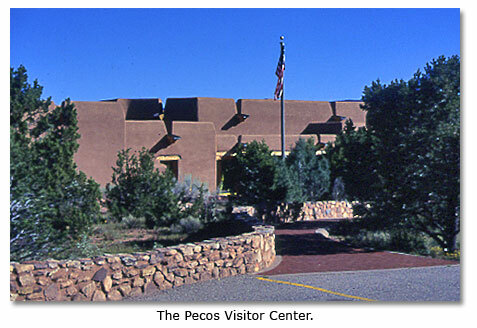 In 1990, Congress enacted a bill authorizing further protection of the 365-acre Pecos National Monument by adding an additional 5,500 acres and renaming the site Pecos National Historical Park. The added land came from the adjacent Forked Lightning Ranch, that had been owned by actress Greer Garson. The ranch contains historical sites, which reflect the Upper Pecos Basin's role as a gateway between the Great Plains and the Rio Grande Valley. The Pecos Visitor Center features interpretive dioramas of the site and an exhibit room where pottery, arrowheads, clay effigies and jewelry made from shell and bone that have been found in the area are displayed. A short introductory film about Pecos and its people helps orient visitors before beginning a self-guided trail leading to and through the ruins. The most impressive ruins at Pecos are the standing remains of an 18th-century church, with its massive adobe walls and arched doorways. Foundations of an older church are also visible. Pecos Pueblo, once home to 2,000 aborigines, is visible today only as large, grass-covered mounds. The site comprises North Pueblo, the largest group of rooms, and the partially excavated South Pueblo. Along the trail between North and South Pueblos, a restored kiva, or ceremonial chamber, is visible. Kivas varied from settlement to settlement, but all were built of rock, covered with plaster and contained roof entries, a firepit, and a "sipapu," or spirit hole, through which the Indians believed their ancestors entered the world. Some kivas had elaborately painted murals on the walls. 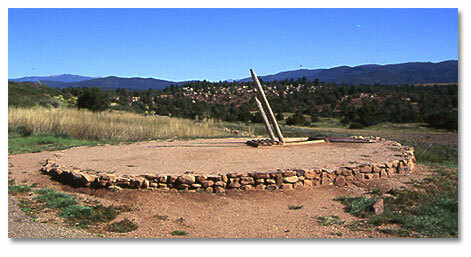 Pueblo people still use these structures as ceremonial gathering places. During the summer, the park has a "living history" program that includes demonstrations by native craftspeople. The first Sunday in August, Pecos National Historical Park commemorates the Spanish influence in New Mexico with a traditional Catholic Mass, held in the ruins of the Pecos mission church. The mass commemorates the feast day of Our lady of the Angels---Pecos' patron saint. When the last Pecos Indians left in 1838, they asked the nearby village of Pecos, New Mexico to care for the saint's painting and to return it to the church ruins once a year for a mass to be held in her honor. Jemez, the last surviving Towa-speaking pueblo, is open to visitors only during feast days; however, travelers are welcome year round at the nearby Red Rock Scenic Area, where Indian food, arts and crafts are sold. Jemez is known for its superb pottery and sculpture. The Scenic Area is located 30 miles northwest of Bernalillo, New Mexico off NM 44. One of the largest pueblos encountered by 16th-century Spanish conquistadors, Pecos played a significant role in the exploration, colonization and missionization of New Mexico. Geological circumstance and geographical location made Pecos a cultural crossroads for centuries. Human activities in the area have centered around the Glorieta-Pecos corridor, a 30-mile-long passage eroded between the Sangre de Cristo Mountain Range and Glorieta Pass by mountain streams. The middle section of this corridor is Glorieta Pass. Since prehistoric times, travel and commerce between peoples of the upper Rio Grande Valley and the Great Plains have funneled through this strategic portal. The Pueblo Indian town is remarkable among Southwestern remains in the completeness of detail spanning the five most critical centuries of aborigine development. The ruins remind us how civilizations flourished and eventually died because of the ebb and flow of commerce. A visit here is both entertaining and enlightening. No camping is permitted in Pecos National Historical Park. Campgrounds operated by the U.S. Forest Service are located eight miles north on Rte. 63. Villaneuva State Park, 30 miles south on Hwy. 3, has camping facilities. Pecos Village, located two miles from the ruins, has restaurants, a grocery store and gas station. The park is located in north-central New Mexico, 25 miles southeast of Santa Fe. From Santa Fe, take I-25 north, exit at the Pecos-Glorieta Interchange, travel six miles to the town of Pecos and turn right two miles on State Rte. 63 to the park. There is no public transportation to the park. Rail passengers can disembark at Lamy for the shuttle-bus trip to Santa Fe, where cars can be rented.